The monk said to them: "I beg you to take me to your captain because I have something to tell you for your own good." They took him to the captain and he said: "Ask all the men to come so that I can tell you something." The captain called them and they came. The monk said: "Aren't there any more?" "I have a cook," the captain replied. "Ask him to come." But when he came, the cook was unable to look at the monk and turned his face aside. The monk then said to the cook: "In the name of our Lord Jesus Christ I command you to tell me who you are, who sent you, and what you are doing here." The cook replied and said: "I'm a liar and I always speak falsely. But since you have bound me with the name of Christ, I can't but tell you the truth. I'm the devil and I was sent by my superior to work for the captain and to wait for the day when he wouldn't read the service of Supplication to the Theotokos to put him into hell. I have been watching him now for fourteen years and I have never found a day when he hasn't read the service." The monk said: "I command you in the name of the Holy Trinity to disappear and no longer tempt Christians." And immediately the devil disappeared like smoke. The monk then taught the thieves. Some became monks, others married and did good works and were saved. This is why I advise you all, men and women, to learn the service of Supplication and to use it in your prayers. 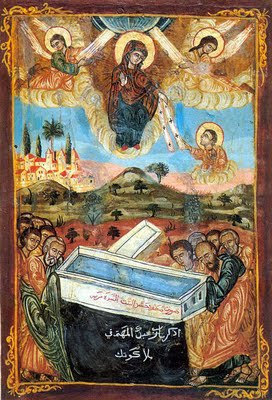 And if you wish, take the book The Salvation of Sinners, which contains the seventy miracles of the Theotokos, of which I told you one so that you might understand.